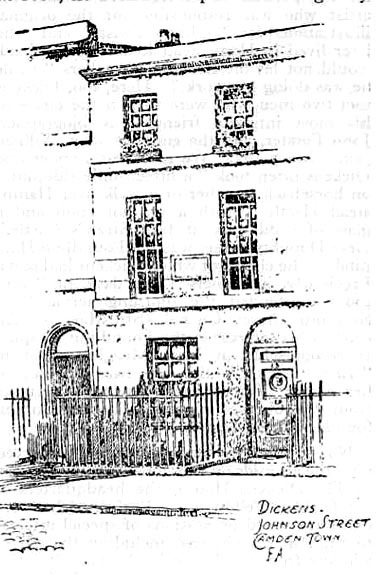 Since the St. Pancras Journal adds "Included by kind permission of J. M. Dent & Sons," this image obviously comes from a volume published by Dent. This illustration from the June 1947 St. Pancras Journal appears in an article entitled "The Immortal of Doughty Street," the second in a series entitled "Renown and Our Neighbour: A series of Articles Concerning Famous Folk in the Story of St. Pancras," by Frederick Sinclair, Borough Librarian and Editor of the journal. On page 19, Sinclair has positioned "Dickens. Johnson Street, Camden Town," in the midst of a discussion about Dickens's early London residences. After the May, 1824, inheritance that resulted in John Dickens's being released from the Marshalsea Prison as an insolvent debtor, he moved his family back to the St. Pancras area, initially to Little College Street, and then to No. 29 Johnson Street, Somers Town for a period of perhaps four years. Sinclair, Frederick. "The Immortal of Doughty Street." St. Pancras Journal (June 1947), 19-20.